Keep in mind that there is a fitness center on site at Crescent Shores. When you are debating whether or not to indulge in an amazing dinner during your North Myrtle Beach vacation you might recall that the exercise room at this North Myrtle Beach resort gives you options for burning calories. So go ahead and order that rich appetizer and get the dessert, too. Covered parking is available at Crescent Shores and each tower has stairs and elevators to whisk your family from the ground level and parking areas to your North Myrtle Beach condominium. There are great views from throughout the North Myrtle Beach condo rentals at Crescent Shores. And these condominiums in North Myrtle Beach, SC are quite spacious. Floor plans at this North Myrtle Beach resort include three-bedroom, three-bath condos as well as four-bedroom vacation rentals with three or four baths. That is likely plenty of room for your family! These North Myrtle Beach rentals sleep between 10 and 16 people. 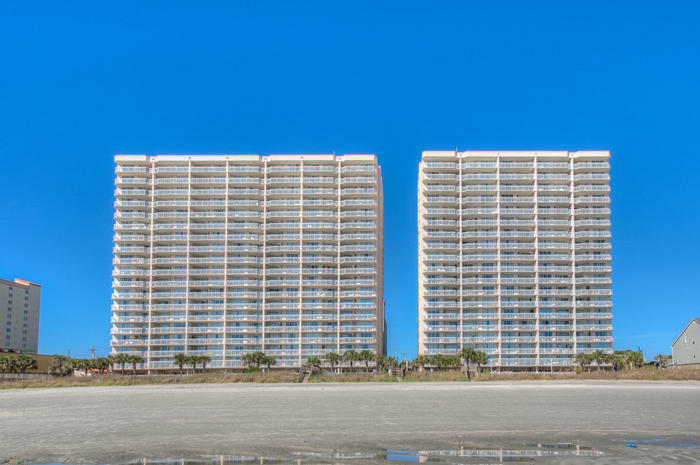 Beautiful and stylish, these condos in North Myrtle Beach, SC are well furnished. They each have a nicely equipped kitchen. Having a kitchen in your North Myrtle Beach vacation condominium is terrific for those nights you want to stay in and enjoy the views from your oceanfront balcony all evening. Make your family a quick breakfast and a hot lunch in the comfort of your own three- or four-bedroom North Myrtle Beach rental. There is a dishwasher in every kitchen so clean up is easy. Take advantage of this phenomenal feature during your North Myrtle Beach vacation. These North Myrtle Beach condominiums also boast a washing machine and clothes dryer, high-speed Internet and at least one DVD player. Having such amenities at your North Myrtle Beach vacation rental is a reflection of your own good taste. These upscale accommodations have an oceanfront balcony from which you can watch the glorious oceanfront sunrise. A star-filled sky and a moonlit night are all you need for a romantic evening in North Myrtle Beach when you vacation at Crescent Shores. The master suite of each of these North Myrtle Beach rentals opens to the oceanfront balcony, too. Keep the sliding glass doors cracked a bit during the night and be lulled to sleep by the rhythmic sound of the crashing waves. There is so much to love about this oceanfront North Myrtle Beach resort. From the white sandy beaches out back to the indoor swimming pool on the front side of Crescent Shores there is something for everyone on site. Just down the beach from this oceanfront resort is the Cherry Grove Fishing Pier, where record catches have been made. Barefoot Landing features shopping, dining and live entertainment theatres and is right down the road. Look for nearby beach clubs with shag dancing, marinas with boat rentals and outlet malls with bargains that will make you swoon. The Myrtle Beach area has more than 100 golf courses so turn this North Myrtle Beach vacation into a retreat for you and your golf buddies. A golf foursome is beautifully accommodated at Crescent Shores since many of the North Myrtle Beach rentals at this North Myrtle Beach resort have four bedrooms. Entertainment is easy to come by in the North Myrtle Beach area. Musical productions, Broadway shows, comedy tours and headliner concerts are found on stage every night of the week. Save a night or two for at least one visit to a live entertainment theatre. There are many from which you can choose and most of them feature kid-friendly shows. Carolina Opry, Alabama Theatre, Pirates Voyage, Medieval Times, Legends in Concert, The Palace Theatre and House of Blues are popular theatres and concert venues in the Myrtle Beach area.